We talked about the internal hardware specifications of Apple iPhone 5s with leaked photos of internal components, here is a list of some of the other specifications, both hardware and software, along with some pictures of the new looks of the new iPhone. 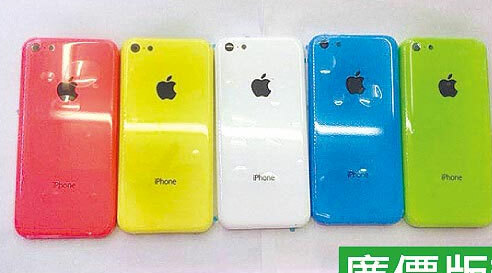 The new iPhone 6 – rumors still seem confused about what the new iPhone will be called expecting that the digits might be dropped considering the iPad Mini ways – would be available in five colors: red, yellow, blue, green and white are the expected ones with the framing part in black or white for all the models. The low cost new iPhone – named as Apple iPhone Lite – is expected to have a plastic back with similar iPhone 5S specifications for both low and high end smatphones. But the Apple fans will still want the iPhone 5S to have an aluminum back and glass front just like the iPhone 5. Some speculations also go with 10+ different colors rather than just 5. On the pricing notes, iPhone 5S is expected to be offered in same prices as the current generation. The new iPhone will be offered with a base 16GB memory for $ 349 and for $ 449 for the 32 GB memory. While the 64GB will come with a $ 549 price tag. Both these iPhone 6 variants are supposed to be in market somewhere during the fall, perhaps in September.